The Clamor Magazine archive is now available digitally—Can you help us make it more accessible? Clamor co-founder Jason Kucsma and I are working on making all of the print content available and searchable through a new web portal. We’ve already digitized the print magazines, and though everything is online now, we still have some work to do to make it an accessible collection for readers, researchers, and enthusiasts. Can’t wait for the new portal? You can view the magazine collection on the Internet Archive here. We need your help to see this project through. We hope that you will consider making a small donation to make this possible. Read on for for more about why we’re digitizing the magazine, and why we need your help. 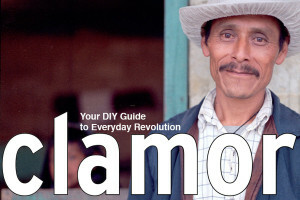 Clamor Magazine existed as a movement publication from 1999 to 2006. For many activists, this was a formative period in our lives, including the Seattle WTO protests, September 11, and the Bush Administration. We printed work from over 800 writers, artists, and photographers. In the early 2000s, magazine publishers, especially independent publishers, were just starting to figure out how to combine online content with existing print magazines. Because of this, very little content from Clamor is online. In preparing for this project, we spent a lot of time with the old issues. I’ve always been proud of how Clamor provided a platform for hundreds of new voices, but looking through the magazines again I am once again impressed with the quality of the magazine. There are so many stellar contributions, including in-depth discussions of issues that are relevant today. This work is important not just as a historic (or nostalgic) document, but because it provides context for current and ongoing struggles. Earlier this year, we worked with the non-profit Internet Archive to digitize the entire print run of the magazine – 38 regular issues and two special editions. Clamor is now completely available online. You can access the archive directly here. The Internet Archive provides an amazing service, but digitizing the print issues is only the first step. We need to build a user interface that will allow anyone on the web to find the content through a search. All of those 800 contributors – how do we know which issue they are in? Which issue has the Boots Riley and Studs Terkel interviews? Where is that thing Naomi Klein wrote? Which issues feature Andy Stern’s stunning photography? Though everything is online now, there is no way to search it. This project will make it all available and easier to find for anyone doing a casual internet search for the individuals, organizations, or key concepts featured in the magazine. We need your help to make the digital archive accessible. This new portal will make all of the content of the entire run of Clamor easily searchable and available online for free. It will replace the existing content at Clamormagazine.org and will be designed and built by Derek Hogue of Amphibian Design, who created and managed the original Clamor website as a dedicated volunteer (for seven years!). The new site will launch in March 2014. We anticipate spending $3,000 on this project, which will pay for programming and web development to make search possible as well as the new user interface, labor for data entry, and the cost of digitizing the magazine through the Internet Archive. The goal of Clamor was to support and amplify new voices. After paying all the expenses we will make a donation to Allied Media Projects and the Allied Media Conference to continue this important work.